– M.U.S.CL.E. – there are 2 in the 236 figure set. I feel this is the right amount for the size of the set. – Original Kinkeshi – there are 4 of him in a 418 figure set. Are we sensing a pattern yet? What the hell has changed? Has he become the 2nd most popular character in Japan? Does he sell a lot of T-Shirts? Jokes aside my guess is that he must be the favourite sculpt of the person creating all the new figures. Whilst I love the work being done here and certainly ecstatic about new figures bi-monthly that feel like M.U.S.C.L.E. Figures, the fact of the matter is I literally groan every time I see another Akuma Shogun in the new releases. I really like 2 of the 7. If the other 5 were never released I wouldn’t bat an eyelid. 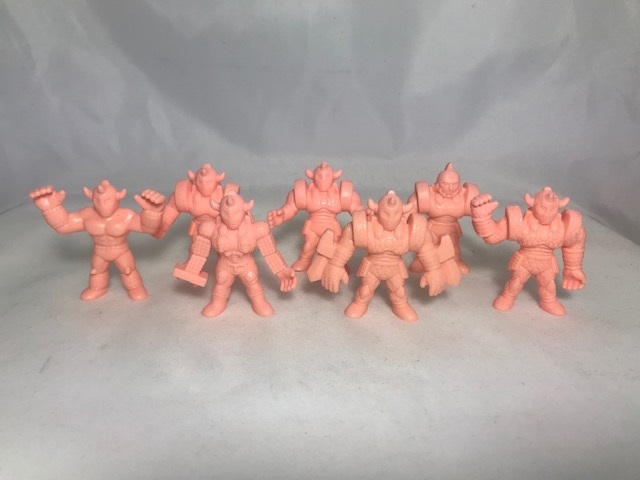 How do you feel about 7 new Akuma Shogun figures? This entry was posted on Monday, February 4th, 2019 and is filed under UofM News. You can follow any responses to this entry through RSS 2.0. You can skip to the end and leave a response. Pinging is currently not allowed. Akuma Shogun is the MAJOR re-occurring villain in the series. He pops up twice during the storyline and once in one of the movies. If you want to see yourself, go to https://www.hokutonogun.com/?page_id=5 and get the episodes from 66 until the current episode; the fight with him is half-over.